Having a reliable backup program is important. But with myriads of backup products available, it has become more difficult for individuals and companies to make the right choice. The AOMEI Backupper Professional is an upgrade of the standard version and comes with tons of features. It serves as a backup for files and as restores tool for files that were accidentally deleted. It also helps for full system recovery and offers unmatched backup speed. We can say for sure that the backup software from AOMEI has all the necessary features and options to be called one of the best backup/recovery software 2018. As earlier mentioned the AOMEI is a feature-rich product and will serve anyone seeking a solid PC backup and restore product. We take had the privilege of trying out this product to determine how superior it is to other similar products. The backup storage of the AOMEI Backupper is superb. 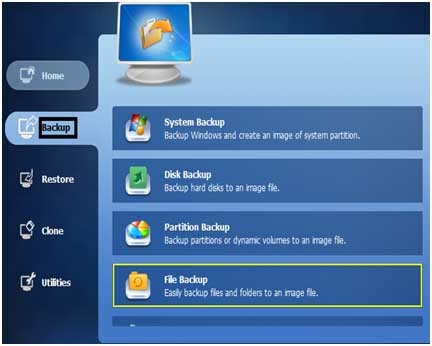 Normally, a backup image is created in the local system disk or folder. But this can be done on an external storage system such as flash drives, USB drives, and external disks. You can also make use of DVD or CD drives if you desire. Individuals and enterprises looking to store their files in the cloud storage or external drive can do so with the AOMEI Backupper Professional, a recommended thing to do in case the system crashes. One of the incredible features of the AOMEI Backupper Professional is its ability to store files manually and automatically. 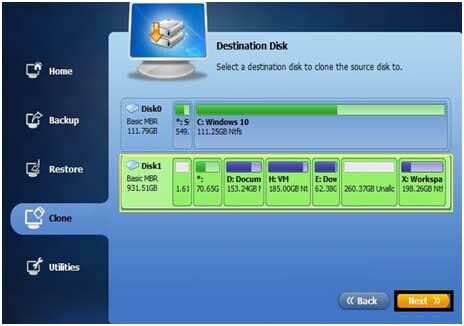 It is also designed to manage disk space automatically by deleting old files to create space for new ones. Interestingly, you can set the AOMEI to perform this function with ease. The product possesses an exceptional disk space management capability which most backup products at this price point lack. 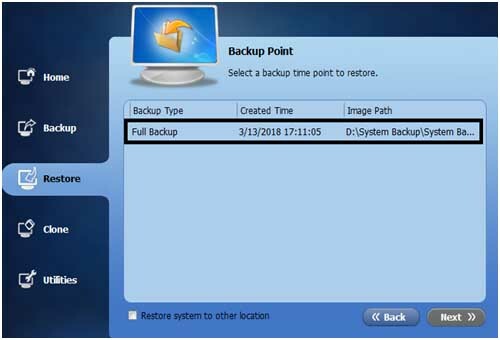 Backups can also be created in a kind of bootable CD/DVD or USB drives so that a crashed laptop can be restored to the condition it was before the crash. A good backup product will never let you down when you need your files restored. That is why the AOMEI Backupper Professional remains the first choice for enterprises and individuals whom as a result of their business dealings end up with tons of important files that need proper storage. Losing such files can have negative effects on the company. However, Backup and restoring are two unique services the AB Professional offers. It can completely recover lost data from files already backed up. In addition, the clone feature is another thing that makes the product superior to similar product in the market. It also has a clone feature designed to clone any portion of the system partition, hard disk or entire system to a drive much smaller or advance. Maintaining absolute security is very important. And this entails preventing others from accessing files behind your back. If you are looking for a backup product that offers maximum security, then AOMEI Backupper Professional is a perfect match. With high encryption, backup image files are protected from unauthorized access. In addition, you can also explore your image files using Windows Explorer, and perform other tasks like inspection of files for damages, errors and even compress image size to create more space. The AOMEI Backupper Professional has tons of features. One of them is that if you have multiple systems that are functioning on the same network, you can use it to backup and restore all of them remotely. 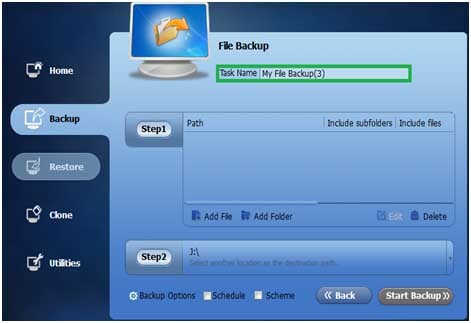 The AOMEI Backupper Professional can help to backup, restore and clone. Below is a simple explanation on how to create the different functions. First, move your cursor to the left tab of the page and click Backup. Then select the File Backup that displays on the page. Next is to name the file to be able to easily identify the file from others. Check the “Task Name” box to effect the changes as shown in the image below. In step 1, click the “Add folder or Add file” tab to be able to select the folders or files you are interested in backing up. After step one, proceed to step 2. Select where you want the image file stored. Lastly, click on the “Start Backup” button on the product and wait a while for the process it to backup. To restore your system, first select restore from the left tab. 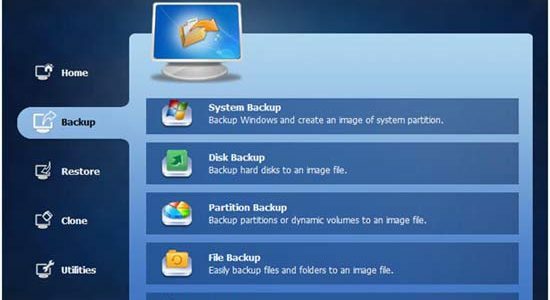 Once you pick the only show system backup, all the backups of your system will be listed. Just pick one and click the Next button to continue to the process. On your system, choose any backup point and click on the Next button to return your system back to the state it was at this point. 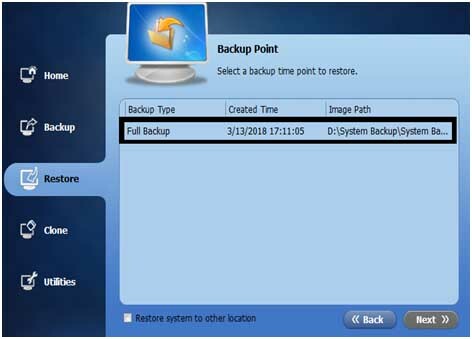 After choosing the Backup point, specify the destination drive if you notice that changes have occurred with respect to the location or size of the original system drive. But if they have not changed, the current system partition which is usually the C drive will be automatically selected by the program as the destination. At this point, you need to check the operation that will be executed on the “Operation Summary” page displayed. This will give you the opportunity to preview your operations, adjust partition size or perform any needed task before executing the command. Finally, click on the tab “Start Restore” and once the process is completed, click on the Finish button. 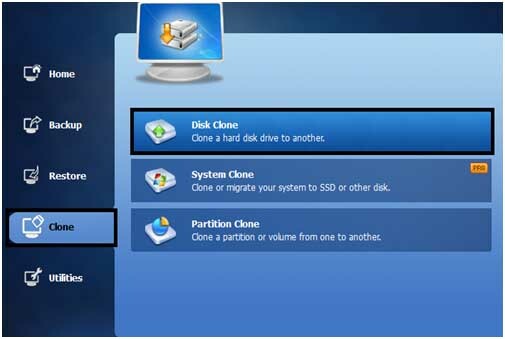 Select “Clone” on the left tab and then choose Disk clone. To access system clone, you need to have the pro version of this program. But both the pro and standard version allows users to do Disk Cloning. Next, choose the source disk you are interested to clone, then click the Next button to move to the next stage. Choose the destination disk that you want the source disk to be cloned to and click the Next button. But note that the destination disk and other data will be automatically overwritten. Next is to have one more look at the information of your destination and source disk before clicking the “Start Clone” button to commence the process. This is the comparison between the AOMEI Backupper Standard and AOMEI Backupper Professional. The Professional is an upgrade from the standard version and offers more features as you can see on the comparison table. Support for dynamic disk Standard version does not support dynamic disk. Built to support dynamic disk which contains dynamic volumes like spanned volume, simple volume and stripped volume. There is no limit to the number of PCs you can install the program on. Accepts a maximum of two PCs that have the license. The standard version is absolutely free for commercial and personal use. The AB Professional cost $49.95 and comes with a lifetime free upgrades. One license can also be used for 2 PCs. Unavailable in the standard version. Not possible in the standard version. Possible with the professional version. You can restore your images from one computer to another even though they have different hardware. The standard version cannot backup files with a certain file extension. The professional version can backup files with a certain file extension automatically. Disk space management Unavailable in the standard version. Automatically deletes old backup images to create space for new ones. PXE network booting tool Unavailable Present in the professional version and helps in maintaining multiple computers within LAN through simply with a micro-system. Unavailable in the standard version, and as a result, files could be lost if not saved before the system automatically shuts down. Performs automatic backup based on user logoff, log on and system shutdown. The AOMEI Backupper Professional is an upgrade of the standard version. It offers more features than the standard version and makes file backup a breeze. You can use it to backup image files remotely. Offers superior disk space management where old files are deleted to make way for new ones and can store files manually and automatically. Although the AOMEI Backupper Standard is free and has tones of features, it cannot be compared to the professional version. The AOMEI Backupper Professional is more reliable and suitable for corporate use and individuals looking for the best backup product. It performs better most backup products at this price point and also very simple to use. Your files are well protected with this device.